Fed up with free anti-virus solution giveaways with subscription period validity of just 3 months, 6 months or 1 year? Most security product developers nowadays attracts user with several months of free usage promotional offer, and then require user to pay an annual subscription fee to continue using the product or to receive the virus signature update. Instead of succumbing to search for new free license key, serial number or activation code every other few months when the subscription period expires or ends, here’s one license key number like no other, for AVG Anti-Virus users. We receive tip off that the following license number for AVG Anti-Virus will only expire on February 26, 2018, a full 10 YEARS validity and free usage. For AVG lovers who installed AVG Anti-Virus by using the one year free subscription license which going to expire by December 1, 2008, the ultimate serial key for AVG is just in time. It’s unclear if the super long activation license key for AVG AntiVirus is part of what promotion, or it’s a leaked serial key. 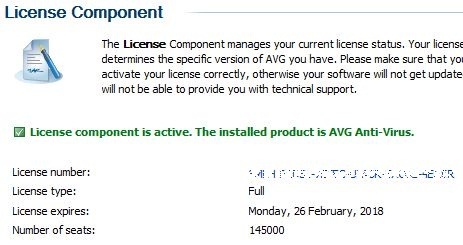 Anyway, the license number will activate a full version of AVG Anti-Virus 8.0, and most likely all its future upgraded version or new releases. There are a total of 145,000 licenses available. To use AVG Anti-Virus for free for 10 years, just download and install the latest version of AVG Anti-Virus setup installer (current version 8.0.196: avg_ipw_stf_all_8_196a1383.exe) from AVG paid version installation file download page. Once installation is completed, AVG Anti-Virus full retail edition will have the license expiry date of 2/26/2018. For users who want the completely free for forever version of anti-virus software, AVG Free Edition 8.0 is essentially the same product with AVG Anti-Virus Pro, except that without anti-rootkit and some online security features. Or, it’s possible to opt for AVG Anti-Virus Network Edition 7.5 with 14 years license. Note: No longer valid. Do check out more free antivirus software available.